Heimars World: Blog Candy bei Flati gewonnen! Jawohl ja. Ich habs Flatis tolles BlogCandy gewonnen, ich konnte es gar nicht glauben. Und heute war mein Gewinn schon in der Post *froi*. Schaut mal, diese wahnsinnstolle Karte, dann die 2 Whiff ofJoy-Stempel (der Santa-Charly und der Schriftzug *Merry & Bright*) und ein Tütchen mit ganz ganz viel tollem Embellishment und Charms. Ich freue mich so. Vielen Dank, liebe Sonja!!! Yes!!! 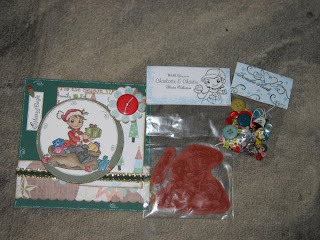 I did win th wonderful BlogCandy of Flatis Blog, I couldn't believe it myself. And already today my prize was delivered by the post. I am so happy!! Look, what I've got: this wonderful and gorgeous card, 2 stamps of Whiff of Joy (Santa Charly and the sentiment *Merry & Bright*). And a big backage of wonderful embellishment and charms. I am sooooo happy!!!! Thanks so much, dear Sonja! Da kann ich gut verstehen,das die Freude groß war.